According to reports, a woman was rejected by The Labour Party for sharing "inappropriate content" about the band on Facebook. 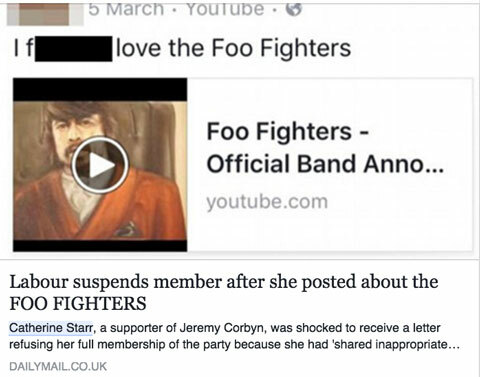 A woman was denied membership to become member of the Labour Party due to her love of the Foo Fighters. As Daily Mail reports, 33-year-old Catherine Starr was denied a vote in the Labour leadership election, after using the f-word, while sharing the parody video made by the Everlong rockers earlier this year. The Corbyn-supporter was shocked to read an email from the party's General Secretary Iain McNicol, which informed her she had not passed their vetting process because she "shared inappropriate content on Facebook" on the 5 March. Starr was then given the opportunity to appeal the decision within 14 days, and was told the lack of any response in this time frame would mean any further application to join the party "would not be considered for twelve months". We wonder if it would have made any difference if she'd written about Billy Bragg?